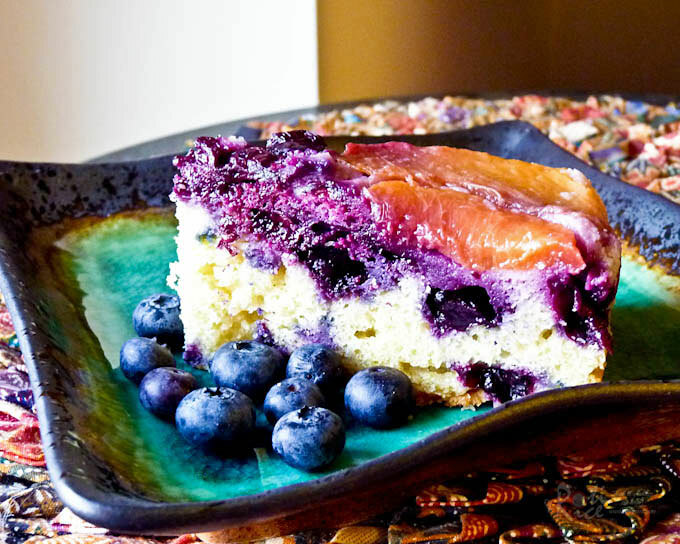 This pretty Nectarine and Blueberry Upside Down Cake is super moist, tender, and delicious. Perfect for tea time or dessert! Happy Monday! I hope everyone had a good weekend. We had a lovely time as the weather was sunny and dry and we were able to do some fun activities outdoors. We also met up with some “old” friends and I made this summery Nectarine and Blueberry Upside Down Cake for our gathering. Peaches and nectarines are in season right now but there are still lots of berries around. I really like the idea of combining nectarines and blueberries in a dish as they are not only delicious together but the color contrast is so striking. 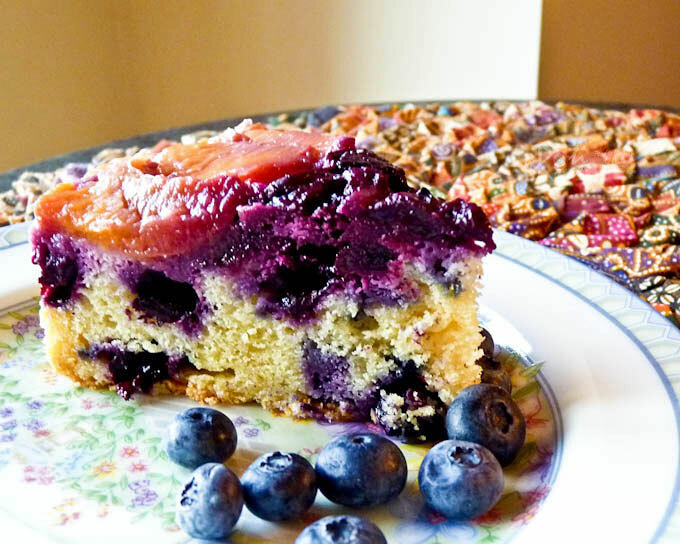 Instead of mixing the fruits together, I arrange the fruits at the bottom of the pan and made an upside down cake. The juicy fruits and addition of sour cream made the cake very moist. Spelt flour provided a tender crumb. Grease and flour a deep 8-inch (20cm) diameter round baking pan. Arrange sliced nectarines in a circle on the outer perimeter of pan. Place ½ cup (60g) blueberries in the middle. In a medium sized bowl, combine flour, baking powder, and baking soda. Set aside. In a mixing bowl, cream butter and sugar till light and fluffy, about 3 minutes. Add vanilla and then eggs, one at a time, beating after each addition. Beat in dry mixture and sour cream alternately on low to medium speed until just combined. Fold in the rest of the blueberries and pour batter into prepared pan. Bake in a 350&#176F (180°C) oven for 60 minutes. Let cake stand in pan for 5 minutes. Invert cake onto plate keeping plate and pan firmly pressed together. Replace any fruit stuck to the bottom of the pan. Cake looks so gorgeous..i love blueberries and this is sooooooo tempting!! Biren, This cake is so pretty and I love all those fresh fruits in it. Really makes me drool.. Thanks Stella! Spelt flour is a little softer and breads and cakes made with them seem to have a more tender crumb. You can substitute AP flour with spelt on a 1:1 ratio. I think you will really like it. Just so you know, there are two types of spelt flour, white and whole just like wheat. Oooh….mango slices sound really good too! Very tropical! Grt cake Biren…….loved your upside down cake…. Pretty. Never made an upsidedown cake but I'll have to try this one! I love the colour of this cake. You're right, the nectarine and blueberry do give a nice contrasting colour. Not only is this a beautiful cake but it sounds delicious with those two combinations, and looks so moist. Fabulous job! Oh wow…that is just nothing but a good time right there. I'm dying for a taste of that. Beautiful looking cake!! Am drooling over the pictures..
Biren, this is so pretty, and it's still summer. So one last summer cake is wonderful (smile). You know, my Mom brought me some organic spelt flour from Atlanta along with a whole bunch of other things I've never worked with thus far. I didn't know exactly what to do with the spelt, but now I do. Yes! The combo of nectarines and blueberries is fantastic! Such a delicious looking cake! That's so pretty and great idea for an upside down cake! It's a great way to show off the color, summer fruit, and the beauty of it. I'm sure it tastes great and it looked so moist! 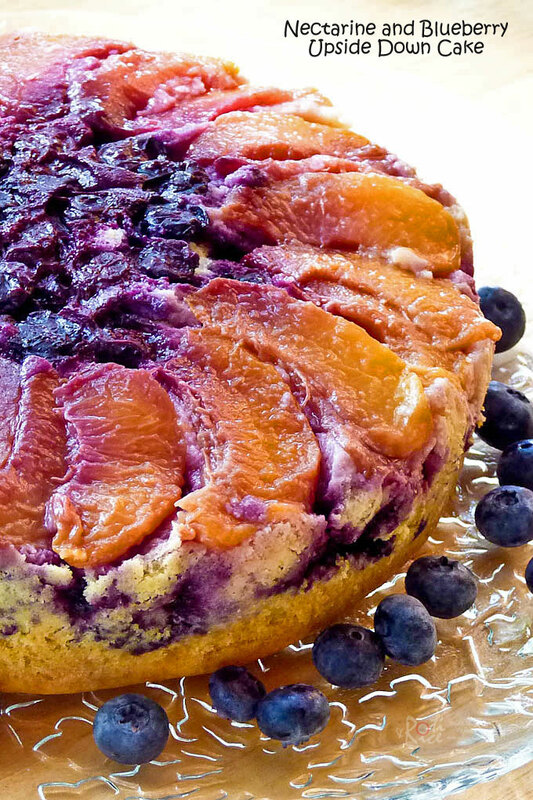 This is such a fun upside-down cake! I never thought to use nectarines, what a great idea! It's so pretty! So beautifully presented. I think the combo sounds really good. I'd love to make this for guests. What a beautiful cake Biren…love the color and the flavor…yummie! This cake is simply gorgeous! Such vibrant colours, perfect with hot tea! that is an absolutely beautiful CAKE!! beautiful cake and such wonferful colors, perfect together , I would surely love this anytime of the day!! Wow! How great! I LOVE all the color! Biren…luv upside cakes and using these summer fruits is so befitting. So beautiful how you arranged the fruit! I've combined peaches with blueberries before but never nectarines! This cake looks fantastic. Gorgeous presentation. A great combination of flavours! Nice to go with some quality coffee. Beautiful tart! I don't think I've ever used nectarines in cooking. Great recipe. What a beautiful cake! I have got to make this for Labor Day weekend! 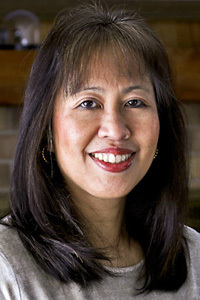 Thanks for the recipe, Biren! Biren, this looks so very good. I love the fruit combo and am now anxious to give it a try. How lovely. I have never been able to bake and I'm afraid to try again. You make this look so easy. I follow all of the instructions, but the end is not what I expect. If you keep making good food and recipies, I'm going to have to try again. That's one beautiful upside down cake! I really need to get a few more peaches and put some of these delicious in season desserts together before it passes me by! Pretty cake…loved the fresh fruits in it.. I love blueberry cakes because they taste quite light. I loved seeing all of that fruit arranged…just beautiful! I imagine that this cake was moist and delicious! What a gorgeous cake Biren! I love the combo of fresh fruit. I bet your guests loved it! Biren, what an interesting combination and I bet it tastes good too. I recently had the opportunity to try an upside down apple cake (sprinkled with brown sugar) and it was delicious. My only other encounter was the classic upside down pineapple cake. All very nice, I must say"
Biren, this looks delicious! I love blueberries and want to try this for sure. You have a great presentation of it! Oh I love this cake!and your display is fabulous!!! I tried Reeni's peach ginger lemon cake last night.This nectarine and blueberry cake is next, thanks for the inspiration! Nectarines aren't as easily available as peaches over here so I like to combine peaches and blueberries. I love how the blueberries bleed into whatever they are baked or cooked with. I'm sure your cake tasted wonderful, good as it looks. What a beautiful cake!! Love the flavors!! Looks so good…. Nectarines are lined up so beautifully. I better cook dinner instead of looking at this delicious dessert.